I first started using Quizlet in March 2016. I created a set of questions and used them as a review at the end of a training session. Next I used Quizlet for my own learning and created study sets to assist in my study of wine. I really liked being able to access the Quizlet app on my phone and study while I walked. Here is a link to a Quizlet study set I made while reading the book "Make It Stick." I most recently used the Quizlet Learn activity as I worked to learn RAPID. I haven't used it fully as it has more long term planning and reminding features. I plan to use this as I study for the WSET Level 3 certification course. Mire about this later. Next up with Quizlet has recently been the new classroom game, Quizlet Live. This is a team collaboration game. It works best with terminology. The first time I used it with a group the energy level went from 20 - 1000. It took me a little while to understand the collaboration piece. When team members sign in they each see 4 different possible answer choices. This is important to explain as you start the game. For some reason it wasn't intuitive to me. 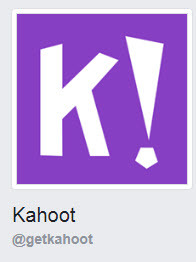 I have used the quiz feature in Kahoot and love it as an in class review activity. I would like to learn more about the Discussion, Survey and Jumble as well as the team aspect of the quiz game.